My work is now on display in the Scholar's Pavilion at Lan Su Chinese Garden through November! I'll be announcing a demo and a Garden sketchcrawl soon. I've just finished hanging my first art show, which opened today at Lan Su Chinese Garden. I'm very grateful for the opportunity to show there, and for their gracious support and guidance throughout the process. That said, I made plenty of first-timer trial and error in preparing for this show! As a life-long *non-professional* artist, I can talk your ear off about watercolor brands and sketchbook paper, but when it came to preparing a show, I didn't know Thing 1. Write the date and location of the work on the sketch because you really won't remember afterwards. It's easiest and cheapest to prepare art for sale if you create work with standard dimensions, so you can buy cheap mat/backing board/bag sets or mat/frame sets. Make sure to figure in the part of the sketch that will be behind the mat, so for a 4x6 work, only 3.5x5.5 will show through the mat opening. I ordered mat/boards/bag sets from Amazon, but next time I'll check with I've Been Framed in Portland. I used cheap Ambiance Studio Frames in order to keep my prices down. I think they were a reasonable choice - the gallery appreciates that the pricing is reasonable and that using plexiglazing in place of glass makes them much lighter and easier to hang - but several are already scuffed up just from transport to the gallery so they've effectively become single-use frames. Doing it again, I'd wrap each piece in a towel for transport and storage. If I was planning to do shows regularly in the future, I'd go with better quality frames that could stand up to a little handling. Lint is also a problem. If a cat walks by within 10 feet as you're framing, the plexiglazing will attract a hair and sandwich it right in front of your artwork. It's worth creating a super clean space to do your matting/framing to minimize this problem. You can buy special gloves for art handling. I didn't do this, and you can tell if you look at my mats/frames :-( So many smudges! The plexiglazing in my cheap frames looks a lot better if you take the protective plastic film off it (!! ), and a lot better still once you put it in the frame instead of holding it up to the light examining its flaws. That said, if you spend much time fussing with it to remove all the cat hairs that got caught inside, it will scratch up and scuff. Best to keep it clean in the first place by working on a clean surface. It's worth it to invest in a mat cutter that attaches to a straight edge guide. I'm not even sure what the purpose is in selling them without a guide, since it's very hard to manually steady the straight edge while pushing with the cutter. Custom mat cutting as a service is so expensive, the mat cutter will pay for itself if you need more than 5 mats in your lifetime. Mat board can be super cheap in Portland at Scrap or I've Been Framed. The gallery may prefer a specific hanging mechanism so frame choice should be made with that in mind. My gallery asked for "D" rings because they use a drop-wire approach to hanging framed art in front of a stone wall surface. 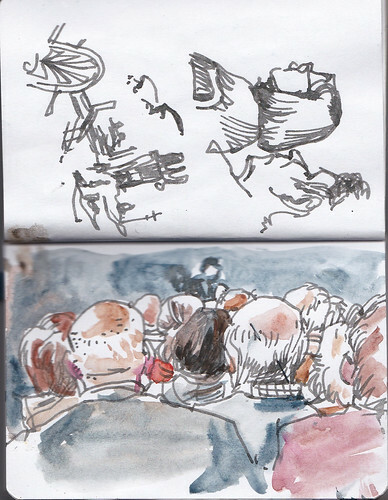 As a sketch artist, it's probably worth investing in a few book easels for display purposes. The gallery I'm working with had these book easels on hand, and I might pick some up for personal and Portland Urban Sketcher use. After talking with a lot of people about pricing, I settled on a range of $60-$120 for original on-location sketches ranging from 4"x6" to 8"x10" (or 5"x7" to 11"x14", matted). I didn't change the prices on the framed works to include the frame cost, but would have had to if I went with more expensive frames. Ask me in two months if my rates turned out to be too high or too low! Next time I prepare a show, I'll be able to produce more professional looking artwork with clean and well-selected mats and frames. For this one... well, people will be looking at the art, right? 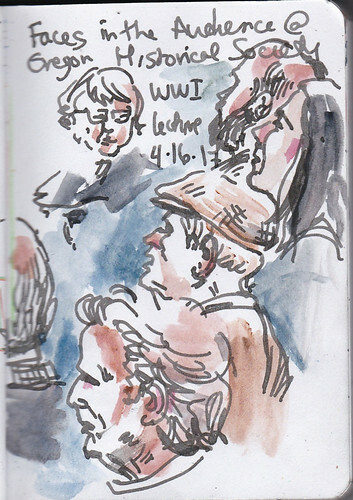 I'm trying to get back in the habit of casual small-scale sketching, so took my tiny pocket Pentalic sketchbook to Oregon Historical Society on Sunday when I attended a free lecture about World War I. I couldn't see much but the backs of heads, but since the audience tended older and male, that actually provided a lot of variety! Nothing fancy, but I enjoyed just fidding with a pen and paper without making a big deal about it, and also was impressed with the look of the neutral brown Super 5 ink laid down with a plain ol' Lamy Safari pen.